Got some croissants left over after the weekend? Put them to good use with this bread and butter pudding recipe. If you don’t have any pastries on hand you can use any sort of white bread but using pastries or croissants raises it to the next level. Whisk the whole eggs and the yolks with the sugar until the sugar has dissolved. Scald the cream with the vanilla and whisk onto egg mix, pass through a fine sieve. Slice the pastries and arrange in layers in a greased terrine mould or loaf tin making sure to ladel some of the custard mix over the pastries between each layer. Push down the pastry and custard mix to ensure everything is well combined and leave to rest for 30mins for the pastries to fully absorb the custard. Bake at 120C for approximately 30 minutes until nicely puffed up and golden brown. Cool, slice and then pan fry in butter or reheat in the oven to serve. Simmer the sugar and water to golden caramel. Carefully and off the heat, stir in the butter and then the cream and lastly the rum. 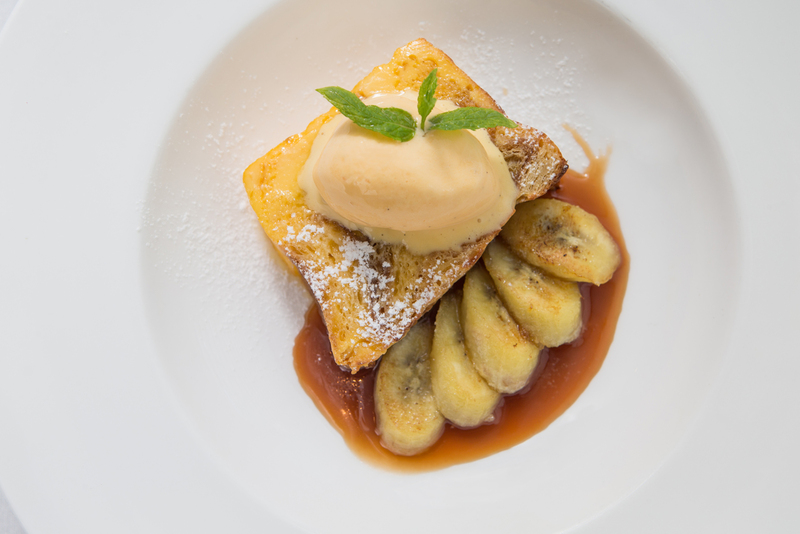 Serve with some fried bananas and some good quality vanilla ice cream or clotted cream.